Summer is officially over. Home exterior upkeep has gone from mowers and hoses to rakes and ladders. No other outside component of your house is as susceptible to the conditions of autumn than your gutters. Leaves, twigs, rain, and low temperatures are locked and loaded and ready to put your gutter system to the test. 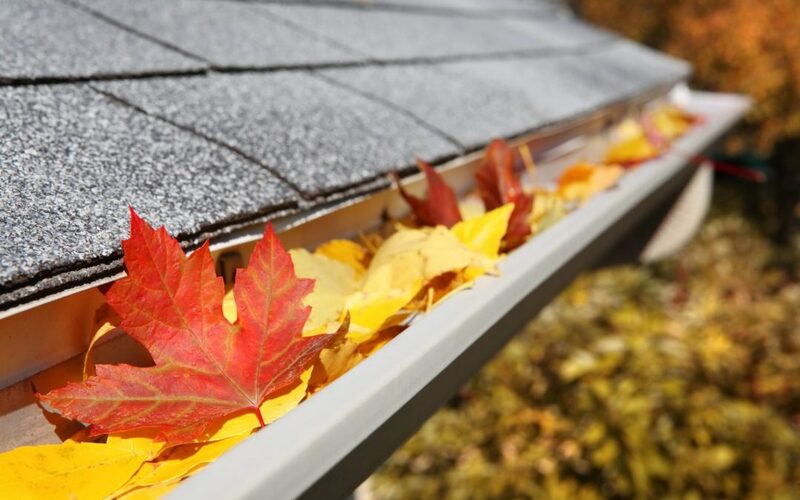 With the first week of October on the way, it’s time to officially prepare your gutters for the season. The first rule of fall season gutter preparedness is clean and inspect. Unravel your garden hose one last time before it’s tucked into the garage until spring and flush out your gutters and downspouts. Give it a high-pressure hosing and then put on your outdoor work gloves to pick up and wipe away any remaining debris. If it’s been a long time since you’ve cleaned your gutters you will want to fill up a bucket with warm water and liquid dish soap and wipe them down with a sturdy sponge. Only when your gutters have been thoroughly cleaned can you perform a proper inspection. The reason for the subsequent inspection? To check for loose brackets/screws, uneven sections, leaks, or any form of excessive wear and tear. Once you’ve cleaned and inspected your gutters you will have a good idea of where repair is essential. This can’t wait. Buy exact-fit brackets and screws and then replace and secure them where needed. If you’ve uncovered leaks, it may be possible to patch them. For good measure, clean the area surrounding the leak again, but this time using a wire brush and water, then scrub with an abrasive pad once it has dried. Apply plastic roofing cement over the hole with a putty knife while smoothing out the edges of the cement. If the hole is too big, you can apply a strip of aluminum flashing to the area, and seal the edges with the cement. If the repairs are significant enough that they have impacted the appearance of your gutters you can always paint them when the weather forecast permits. Autumn doesn’t just bring falling leaves and rainfall, its cold snap sends rodents (mice, rats, squirrels, and raccoons) packing for higher ground. The cozy beds presented by your concave gutters and downspout exit points gives them a place to nest. Pay a visit to your local home and garden store for humane rodent repellent and check your gutters often through the season to ensure they are free from nesting intruders. No matter how well you’ve trimmed your trees and raked the yard leaves will still find their way on to your roof. It’s what they do. If you don’t yet have them, autumn is prime time to finally install gutter guards. A gutter guard is a fitted screen with pinpoints wide enough to allow rainwater to collect within and funnel through while preventing leaves and twigs from entering. A sound leaf protection system will accommodate both vinyl and aluminum gutters will be maintenance-free and can be installed on your existing system by a professional without hassle to you, the homeowner. Your inspection, cleaning, and attempts at repair may have evidenced that your gutters need replacing in the near future. If that’s the case, then it may as well be now. Delaying the inevitable and waiting another year or two can spell big trouble. One harsh autumn storm could deal the final blow that results in significant gutter damage, a damage that will impact your landscape, home exterior, and worse…the interior. The good news is that you are entering the best season to make your decision on a new system. Depending upon the height of your roof and exposure to foliage (trees in close proximity) a new standard system may be all that you need to get you through numerous autumns to come. A 5 or 6-inch continuous or eavestrough system can be professionally mounted on your fascia board with relative ease and in time for autumn’s first bite. A 5-inch fascia or eavestrough gutter system (for roofing without a fascia board) can also be installed with minimum turnaround time. If you feel that your home needs something even stronger to make it through a decade’s worth of seasons, then you will want to consider a premium European manufactured high-grade aluminum, copper, zinc, or steel. Don’t delay your installation – contact the Metal Roof Canada professionals as soon as possible, before the weather catches up with the calendar.